William Bohdan “Bud” Bohach passed away the evening of April 11, 2019 in the Kelowna Hospice, after a short palliative illness, in the loving arms of 4 of his children and grandson Dylan. He died in peace, dignity, courage and mercifully free of pain or suffering. He longed to be in the loving arms of his wife and inseparable companion of 66 years, Kae Bohach, who predeceased him suddenly 8 days previously on April 3rd. It is not an understatement to say that his was a beautiful passing from this mortal earth. Bud was a gregarious, outgoing character who loved to entertain and socialize. He was the Yang to Kae’s quiet Yin. Any visitor to their home was instantly offered food, a drink…often of homemade wine of dubious vintage…and an orange! “Enough” or “I’m full” were phrases that were not tolerated! !…and while Mom was in the kitchen preparing mountains of food, Dad was in charge of making sure every morsel of it disappeared down a visitor’s throat. His father Harold immigrated to Canada from Denysiw, Ukraine in the spring of 1927 and worked as a labourer on farms and the Canadian National Railway earning whatever money he could to both save to purchase land in Canada and sending a portion back home to support his wife Eva and 3 children Mary, Susan and Sophie who remained behind. Eva and family arrived 4 long years later and Bud was the product of his parent’s reunion and was born at home in Polworth, Saskatchewan on June 18, 1932. This was the typical story of Ukrainian immigration at the time. Harold was able to purchase land in the Honeymoon district of northern Saskatchewan, situated north of Prince Albert, and moved his family there in February of 1934. There Dad/Bud grew up in a remote but vibrant Ukrainian community. As the only boy in the family, Dad had heavy responsibilities to share the workload with his father. At the time there was little modern machinery and most of the farm work was done by hand or with horses in a manner not much different that was performed in the Ukraine for hundreds of years prior. By the age of 14, Dad was trusted to run a team of heavy horses to perform any field work required. 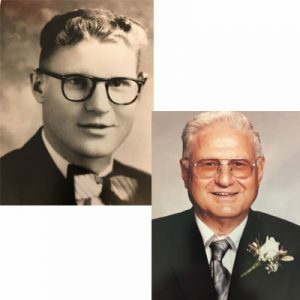 Bud began his schooling in a one room schoolhouse in Honeymoon where one teacher was responsible to provide an education for students from grades 1 to 6. The nearby mainly Francophone community of Albertville had the luxury of providing an education up to grade 12, so Dad began grade 7 there. In those days it was rare for a boy to attend school past the age of 15. They were needed on the farm. But Dad was one of those rare boys that completed his grade 10. At age 19 he was given the opportunity by his father to attend a diesel and farm equipment mechanics course in Edmonton so that the family could know something about the heavy machinery that was starting to appear at the time. On his way back home from Edmonton on the passenger train, he had to stop in Saskatoon to transfer to a train for Prince Albert. There he saw a beautiful young woman who was also on her own journey home from a nursing course in Winnipeg. He was smitten. After disembarking the train in PA, they had lunch together at the Broadway Hotel and thus began their love affair together. They married on November 15, 1952 and settled on the family farm in Honeymoon. Their union produced 5 children…Adrian, Celestia, Loring, Carmen Christine and Tyler. The family moved to the city of Prince Albert in 1965 primarily to provide better educational opportunity for their children. Their Dad worked at various manual jobs, often working night shifts so he could continue running the Honeymoon farm. Dad built a new house on the farm and moved the family back there in 1978. After a brief relocation back to Prince Albert, the farm was finally sold and Dad moved the family to Red Deer, spending 3 years there. At this point all the children had flown the nest and Mom and Dad did what every Saskatchewan farmer dreams of…which was to move to the Okanagan. They spent approximately 8 years in Vernon and then moved to their dream house in Kelowna in 2000. Mom and Dad loved that house!…the beautiful property, the neighbourhood and their great neighbours. Health concerns created the painful choice of having to sell their dream house and move to the Northwood retirement facility in 2016. Dad was a very active member of the Ukrainian Orthodox Church. His faith was unshakeable. Both Mom and Dad spent many years volunteering to keep especially the Kelowna church maintained, which included cleaning toilets, vacuuming, looking after the candles, etc. while their health allowed. He loved his family. Dad historically had difficulty showing this love or expressing it. But as he aged, his ability to demonstrate this love became much easier. In his final days, that love simply flowed from him unabated. He faced his palliative condition with acceptance and courage. Not an ounce of anger flowed out of him. More than anything he loved Kae, our mother, with all his heart and her sudden passing made life without her lose all its savour. It was clear his own life was soon over and he viewed his impending death to be an immense blessing…because he knew it would allow him to be holding his wife’s hand…soon once more. He achieved this blessing only 8 days after her passing. He died a happy man! Funeral services for both Kae and Bud will be held at Springfield Funeral Home, 2020 Springfield Road, Kelowna, at 10:00 a.m. on Tuesday, April 23, 2019. Lunch will be provided after the services. In lieu of flowers, the family suggests making a donation in both our parents’ memories to the Kelowna Hospice or any hospice of their choice. The prayer service for BOHACH, William “Bud” is scheduled for at located at , . The service for BOHACH, William “Bud” is scheduled for Tuesday, April 23 at 10:00 am. Below you will find the map for the service location and the contact information should you have any questions. I am so sorry for your loss and the tremendous loss to all of us, friends of your parents. They were one of the loveliest people I have known. I will miss them greatly and cherish very fond memories of visits with them and our trip to Ukraine. May they rest in peace.. Vichnaya pamyat! To the family of Bud and Kae, our deepest condolences goes out to you all. We are so thankful that we got to see them last August where we spent the afternoon with them and had supper with them. We will cherish those memories always. They were truly special people to us and we are all greater for having known them. God Bless you all. For the family of Bud and Kae, and all of their wonderful friends. Our deepest sympathies can only remind us that Bud and Kae will last forever in the memories of those who knew them, and through fond recollections be passed on for generations to come. Our visit to Kelowna with Loring and our daughter Daphne were filled with warmth and kindness, and of course our bellies were filled with Kae’s famous perogies.